We organise intimate music and theatre performances atop the High Level Bridge in Edmonton. We meet at the back of the Arts Barns, by the tracks. 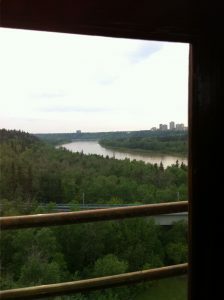 The authentic Edmontonian streetcar (from 1912) takes us to the High Level Bridge and stops right in the middle of it for a first set of music and wonderful views of the grand North Saskatchewan and the river valley. After crossing the river and a little break we return for a second stop on the bridge with more music. Want an impression of the shows? Check out Peter Seal’s website! The only way to find out about the shows and tickets is to be on the mailing list, which is currently closed (please see note in right side bar). Tickets sell out very fast to people on the mailing list alone and are not advertised anywhere else. Artists will be announced in the mail outs only. All shows are 2 hours, tickets are $30. Please consider: these concerts are truly one-of-a-kind in a beautiful intimate venue. To have high quality live music shows on a 100-year old streetcar, on a 100-year old bridge over a majestic river, at sunset is (as far as we know) done nowhere else in the world. The $30 per ticket covers the price of the ride, decent pay for the musicians, and a small amount to keep our non-profit organization running. We think it’s entirely worth it. We hope you will too. Sorry, we have closed our mailing list… There are too many people in the race for tickets, which makes it really difficult to get one. So we've limited the number of people on the list. We'll post here if the list opens again.